With a massive 570,000 entry English <-> Portuguese Translating Dictionary, an easy to use bilingual translating Picture Dictionary, a complete English explanatory dictionary and Full Text Translation, the remarkable new EPg900 Grand contains everything you need for superior translation and accurate communication. Exclusive User Dictionaries allow you to store your own personalized lists of frequently used words and a history function remembers your most recent translations to provide instant access to the information you need to understand and be understood. Delivering flawless voiced output of all the words in its enormous database with True Voice human pronunciation, the EPg900 Grand offers a unique chance to improve your pronunciation by hearing how a native speaker says a word or phrase. A pre-recorded word list provides access to the dictionary's spoken entries. The world's most advanced English and Portuguese Speech Recognition modules let you speak into the device in your own language and get an instant, hands-free translation that can be spoken out loud in the target language. 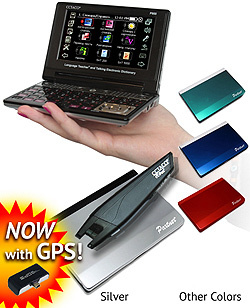 Complete with a bilingual interface ECTACO Partner EPg900 Grand - English <-> Portuguese Talking Electronic Dictionary and Audio PhraseBook with Handheld Scanner allows anyone to learn English or Portuguese using the most effective methods ever developed for independent study. With the patented Language Teacher system that comes pre-loaded on the EPg900 Grand you are well on your way to complete control of a new language within minutes. One of the most effective methods ever designed for language study, it employs the advanced True Voice and Speech Recognition modules and step-by-step lessons to guide you comfortably from beginner to advanced speaker. With a full set of enjoyable games and exams, you improve your language skills naturally and intuitively. The inclusion of the unique U-Learn™ Car Tutor lets you study hands-free and eyes-free to make use of every spare moment to improve your language skills. In addition, with the unique Word-of-the-day utility, a Memorize splash screen appears when starting an application to show you a useful word or phrase, a translation and a corresponding picture. It's an excellent way to improve your vocabulary and master a foreign language! The EPg900 Grand offers the most sought-after extras to make every trip you take more enjoyable. A handy Voice Recorder lets you record conversations and audio notes and the built-in Video Player supports .avi, .wma, .wav, .ogg, .jpg and .png audio, video, and image formats so you can access your favorite media files anytime, anywhere. In addition, the EPg900 includes a World Time clock, Metric Conversion, and a Calculator to keep you organized. Easy to navigate and astonishingly responsive, the customizable and intuitive Windows CE powered interface offers instant access to the information you need quickly, easily and dependably. A Smart Virtual Keyboard with Audio interface and layout for both languages complete the built-in support that makes the EPg900 Grand different from all the rest. ECTACO GPS package! Order now for only $ and get to your destination easily!